Whether you're someone who is into watching storms or not the chances are that you can appreciate a storm scene like this. This design caught our eye because the photographer has caught the lightning perfectly just striking out from the sky. Although the sky is dark there is a subtle touch of light which makes the whole scene a real joy to watch. You can just see a peak of sand and the subtle glow of the sea which helps to make sure that the darkness of the storm is counteracted by a little bit of light. 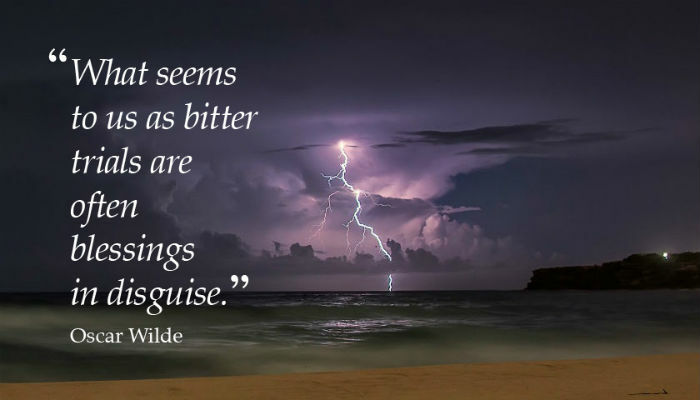 As we often like to do with our ecards we wanted to choose a fitting quote to go with this ecard and for our Stormy Blessings business ecards we chose this one by Oscar Wilde. We liked it because it seemed to go with the storm scene - often a storm is seen as dark and dismal but it often is the start of something much newer and brighter the next morning which is lovely! This ecard can be sent for a number of reasons, or simply to let someone know that you are thinking of them and you want to say here. Eco2 Greetings has a number of different ecards especially corporate holiday ecards for you to choose from, so if this isn't perfect keep looking until you find something that is.